In 1997, a book was published that made sense of the business world – and terrified corporate executives. It was “The Innovator’s Dilemma” by Clayton M. Christensen, a professor at Harvard Business School, and it answered two questions that CEOs in the 1990s were asking frantically: Why were so many highly regarded corporations losing ground to startup companies? And how could they stop it from happening to their companies? In his book, Christensen focused on technological change – change so great that it altered the business models in an industry. Sometimes, he wrote, this disruptive change came fast, as when the Internet undermined the music industry in a few years’ time. Sometimes it came more slowly, like the decades-long decline of Sears and rise of discount retailers like Target and Wal-Mart. One thing about disruptive change was clear, Christensen wrote. Big, established companies didn’t handle it well, and the companies that did were mostly smaller and newer. In this posting, I want to talk about how disruptive change comes to cities – change that alters a city’s growth model. Unlike corporations in the 1990s, the key to how a place manages disruptive change isn’t size – some big cities handle big changes well and many small towns handle them poorly – but rather leadership. And that’s because in communities as in corporations, the way to manage major change is to do things that, to many people’s way of thinking, don’t make sense. For citizens to go along with these things, there must be a high level of trust in city leaders. 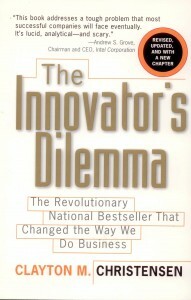 But before we talk about cities, let’s go back to “The Innovator’s Dilemma.” The part of the book that terrified executives was Christensen’s discovery that the victims of change were often among the best managed companies – “the kinds that many managers have admired and tried to emulate,” he wrote, “the companies known for their abilities to innovate and execute.” Even more frightening, he added, many of these companies had seen the disruptive changes coming, tried their best to accommodate them – and failed. So what went wrong? In times of disruptive change, Christensen said, executives depended on practices that had served them well in normal times – things like listening attentively to their customers, offering customers a steady stream of new products, and investing in products with the greatest potential returns … in other words, the things they had learned at Harvard Business School. Problem was, disruptive change wasn’t normal. It didn’t come from a company’s best customers, who were usually happy with the way things were. It began with marginal customers, people who wanted products that were simpler, smaller, cheaper – and far less profitable. These were the people who wanted desktop computers in the early 1980s: hobbyists, early adopters and small companies willing to learn DOS and be their own IT departments. These weren’t the corporate customers that IBM and Digital Equipment Corp. were used to dealing with. IBM tried serving these marginal customers but gave up; DEC never really tried. So the marginal customers (who, of course, became the vast majority of computer buyers in years to come) were handed over to startups like Microsoft, Apple and Dell. For large corporations, Christensen wrote, the way to manage disruptive change was to do things that almost defied reason. First, they had to devote themselves to identifying and understanding fringe market segments that had the potential of growing fast. Second, they had to supply these marginal customers with cheaper, simpler products, tailored to their needs – even if the profit margins were slim or non-existent and threatened to undercut existing products. Third, they had to create special units to serve these marginal customers. Finally, they had to protect these units from being judged by corporate standards or run according to company rules. In other words, they had to turn practically every corporate instinct and well-established practice on its head. No wonder so few companies made the transition. Natural or man-made calamity: This is easily grasped. New Orleans will never be the city it was before Aug. 29, 2005 when Hurricane Katrina struck, and most citizens accept that. Economic change: This is much harder to see than a natural calamity – and some will deny it’s taking place. 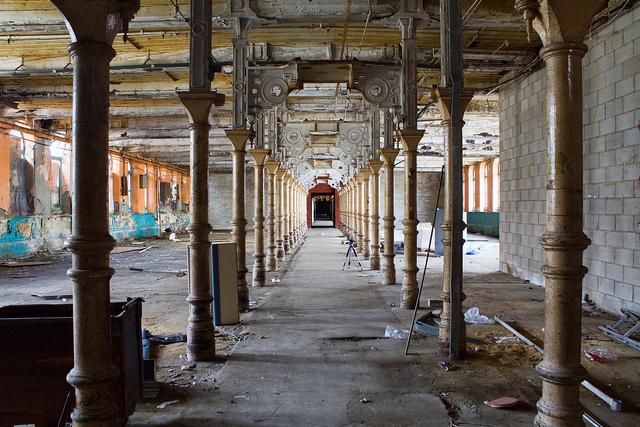 Michigan cities, for example, have known for 30 years that the auto industry was in decline, but many have been unsuccessful at developing alternative economic bases. Demographic change: Same difficulties as economic change: Demographic change is hard to see because it tends to take place slowly, and denial is a common reaction. There’s an additional problem, and that’s bias. Old-timers often don’t like the newcomers and some will oppose any efforts to help them. Major political change: Cities are particularly vulnerable to political changes at other levels of government. For example, you can date the long decline of California’s local governments (and, for that matter, state government) to the passage in 1978 of Proposition 13, the tax-limitation law that changed the way government services were paid for. Changes of taste, values or world view: This may be the single hardest disruptive change to recognize and manage because, unlike economic and demographic change, there are no reliable numbers to point to, and unlike calamities or political change there’s no event (tornado, hurricane, new laws, etc.) to mark its beginning. There’s simply a group of people who begin to think about things differently. Example: The Jane Jacobs-inspired movement toward mixed-use neighborhoods. Surely, these are big changes. But what makes them disruptive? Because they have the potential of changing a city’s growth model – the elements that make a place grow and prosper and support the services that citizens want. The disruptions can be good ones – as in the turnaround that many big cities saw in the late 1990s when young people and empty-nesters returned to urban centers – or bad (see Proposition 13, above). Either way, the change has to be so great that the city grows or pays for public services in a fundamentally different way afterward. Begin by recognizing changes before they become obvious. Again, this is easy to do in a natural disaster, much harder to do with changes of taste or world view. But I would add that, except for calamities, disruptive change rarely comes suddenly to cities. If a city wanted to adapt to changes of attitude about transit and mixed-use development, for instance, it had a long, long lead time. Jane Jacob’s seminal book, “The Death and Life of Great American Cities” – the one that inspired New Urbanism – was written in1961. Don’t try to address disruptive changes using the same processes – or people – your city uses for other types of change. For instance, don’t ask the city’s department of transportation to make the city more walkable if its mission has long been devoted to making it more drivable. Create a new agency or organization to handle walkability issues. Much later, if the DOT has accepted walkability as central to its mission, you might bring it into the department … but be careful. Don’t measure progress using familiar yardsticks. That’s because you’re investing in the future, not the present. And the future, well, hasn’t happened yet. Transit critics, for example, often point to the millions being poured into light-rail projects and the relatively small numbers riding these new systems. Using that logic, which infrastructure would you have invested in 100 years ago, expensive paved roads used by a few automobiles or cheap dirt roads for the many horses? Again, the question isn’t which is the most efficient investment by today’s standards but which is the wisest investment for the future. The key terms, in talking to the citizens, are “future” and “investment.” Citizens like leaders who are hard-nosed visionaries – people who can sketch an appealing future, point out the ways of getting there and deliver results. By and large, citizens aren’t blind; they will accept some sacrifice, as long as it leads to a place they want to go. They’ll even put aside some of their prejudices, if they can see how it can benefit them in the long run. But it starts by seeing the changes that are coming and knowing the right responses. And what if you’re not a particularly visionary person? Don’t worry, there are plenty of people in your city who think about the future. Just ask around. Take a few of them to lunch. Look at the city’s demographic and economic indicators. Ask legislators about major changes in politics and law. Read up on how cities elsewhere are changing. Photo by Tom Blackwell licensed under Creative Commons.